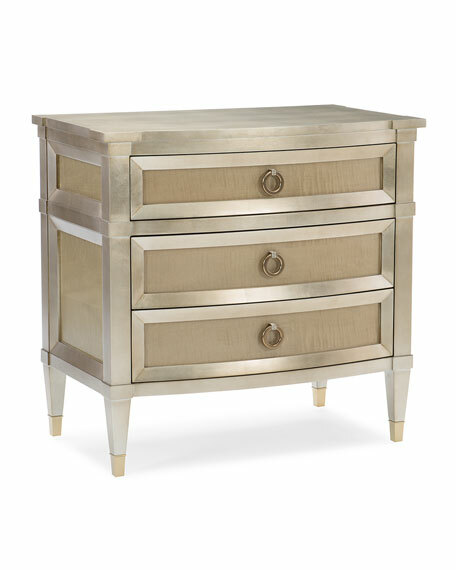 This three-drawer night stand offers updated traditional styling that complements the design of any bedroom suite. Crafted of Fumed Figured Tiger Maple, it's finished in Smoke and features a Taupe Silver Leaf top. You'll enjoy the lovely silkscreen trellis pattern on the inside bottom of its top drawer every time you open it. Metal ferrules add a finishing touch and coordinate beautifully with other metallic finishes in the space. Birch and fumed figured tiger maple frame. Self-closing guides on top drawer. Overall, 32"W x 19"D x 31"T.